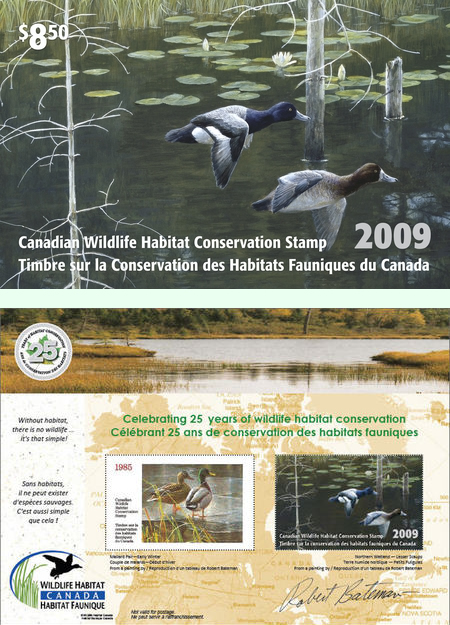 The year 2009 marks the 25th Anniversary of the Canadian Wildlife Habitat Conservation Stamp program. Stamp collectors know this stamp program from the annual release of a single stamp used by hunters to validate their game bird hunting license. These beautiful stamps began being issued in 1985, and they always depict waterfowl in their habitat. According to the 2009 Unitrade Specialized Catalogue of Canadian Stamps, the Migratory Bird Regulations require that each hunting license have the current conservation stamp affixed to it before hunting. The stamps are also sold to individuals who purchase a limited edition print, and funds go to preserving wildlife habitat in Canada. All unsold stamps are destroyed each year. Also available for purchase by collectors are «on license» stamps, licenses with the stamp on it that are in good condition and undamaged. Every year a select group of artists is invited to submit an artistic impression, from which the stamp design is chosen. 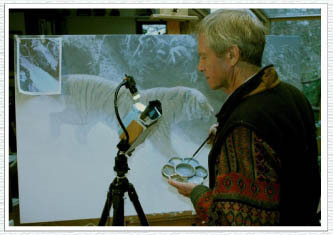 The first conservation stamp issued in 1985 featured a painting by Robert Bateman, and for the 25th anniversary, a painting by Mr.Bateman was once again chosen for the stamp design. The 2009 stamp will bear the image of lesser scaups. To further commemorate the year, there will be a special edition souvenir sheet available for purchase featuring the first conservation stamp of 1985 as well as the one for 2009. Buyers will also have the choice of purchasing a souvenir sheet signed by the artist. Born on May 24th, 1930 in Toronto, Ontario, Robert Bateman is a premiere Canadian wildlife painter. Bateman began painting in his childhood, fascinated with nature and the creatures he would observe. Never thinking he would ever make a living from his art, he now receives major recognition for his works. The lesser scaup is a diving duck of North America which lives by lakes and bogs. The lesser scaup can be distingued from the greater scaup by its size, being noticeably smaller. Arpin Philately has a selection of wildlife conservation stamps «on license» for sale.